Heat the grill to medium-high and cook the sausages, turning regularly, for 15-20 minutes until browned and cooked through. Meanwhile, pour 1cm olive oil in a deep frying pan over a medium-high heat. Toss the onion in a mixing bowl with the plain flour and salt and pepper. Put all the spice seeds in the frying pan with the oil and fry until they start to pop and colour, then add the floured onions to the pan and fry, stirring from time to time, for 15 minutes until deep brown and crisp. Drain on kitchen paper. 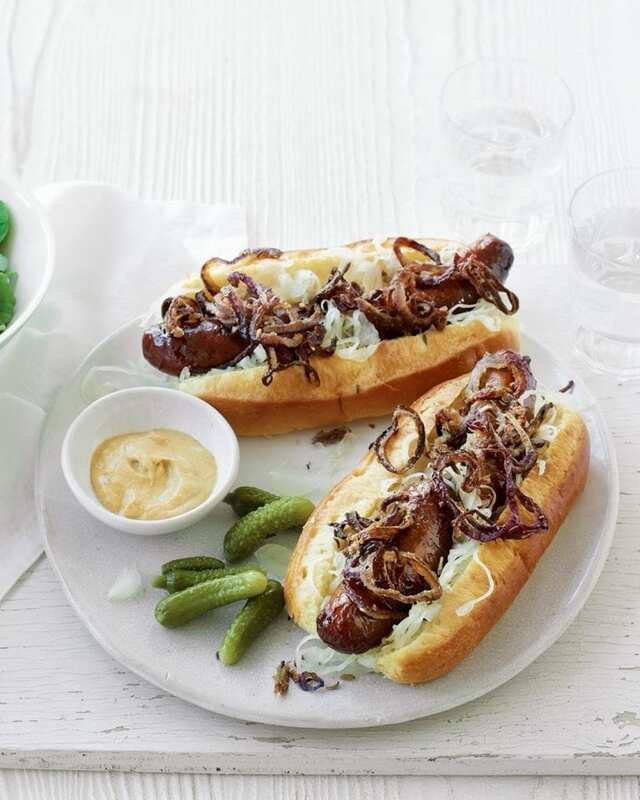 Cut the hot dog rolls lengthways almost all the way through, then toast under the grill for a few minutes. Fill with sauerkraut and 2 sausages each. Pile on the crispy onions (and any spice seeds), then serve with salad, cornichons and dijon mustard. Fry the onions 1-2 days ahead and chill in an airtight container.